when the first grandchild comes along, consternation will undoubtedly follow for all sorts of reasons, not least of which is as to how the new grandparents will be referred. 'granny' and 'grandpa' would seem the most obvious appellation, but neither are particularly unique, and when there are two sets of grandparents, some means of differentiation would be an ideal introduction at an early age. it'll be a few years before the little prince or princess acquires the ability to voice their own means of addressing anyone withn earshot, but it would seem like good practice to get in there first. as both mrs washingmachinepost and i are domiciled on an island, granny islay has been brought to the fore during apple 'facetime' sessions. for my part, however, bearing in mind my ambition to become victor meldrew, i have opted to be addressed as 'grumps' which, rather comfortingly, nobody has raised any objections to. in fact, several of the kids in mrs washingmachinepost's care as a childminder have opted to use the slefsame epithet on a daily basis already. years ago, when still at school, we used to exercise our brains by starting with one word and, by changing a single letter at a time, in a pre-determined number of steps, change it to another comprised of the same number of letters. in the case under discussion, it would be only a single alteration to move from 'grump' ro 'grimp'. though the latter is hardly a fully formed word, it is the precursor to the cycling term 'grimpeur', as in one with a predilection for climbing ruddy great hills. there are few, if any, ascents fitting such a description round these here parts, but the few short, sharp climbs that do exist, offer at least a tentative opportunity for 'grimpeurship' amongst the local pelotonese, including yours truly. many worthy of such an epithet inhabit the body mass of a small vegetable and a stature that rarely brings them eye to eye with tom boonen. in addition, weight assumes an altogether obsessive importance, for if intent on riding uphill for many a long kilometre, the less mass that has to be transported, the better. i cannot claim to be a weight weenie in any way, shape or form. it is rare, in this closeted little world of ours, that items of componentry, bicycles or apparel achieve the promise that commercial sponsorship would seem to claim. for example, if a new pinarello dogma or rapha climber's jersey truly conferred the same properties upon mere mortals as they appear to do for messrs wiggins, froome and porte, there would be queues outside 'imperial works' and the nearest pinarello dealer. of course, in a simplified fashion, that is precisely the notion that the sponsors wish to confer in the first place, and to a certain extent, the mamil generation is happy to comply. 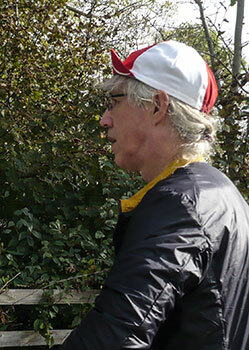 however, when the lovely yet cheerfully eccentric folks at this is cambridge bring out a grimpeur's cycle cap, or casquette, suggesting that the wearing of same might lessen the time taken for any ascent you care to mention, one should surely approach with healthy degree of circumspection? and i did, though it transpires that their nomenclature might possibly contain a greater degree of truth than one might expect. in effect, this red and white casquette comprises four panels; two white and two red, augmented by the thin strip of ribbon from centre to edge that has pretty much become tic's trademark. in order to lessen the unsprung weight, the cap is unlined, while the underside of the peak bears an idiosyncratic arrow graphic the origin of which i know not. there is an alternative uniform, off-centre squiggle pattern and while neither seem obviously explicable, they are satisfyingly intriguing. 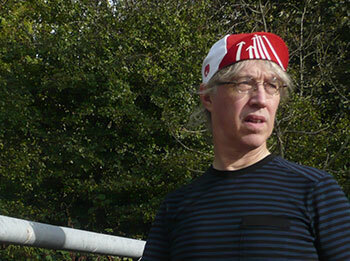 the cotton is a tad thinner than tic's regular panache range and more than ideal for wearing 'neath a helmet. scrabbling up the hill at foreland in the company of a fellow member of the velo club, i was several lengths ahead by the time we summitted, not necessarily a common occurence. 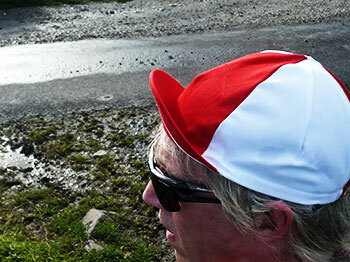 since he is usually no slouch on the uphill, i can only surmise that it was the grimpeur cap that made the noticeable difference. what else could it have been? 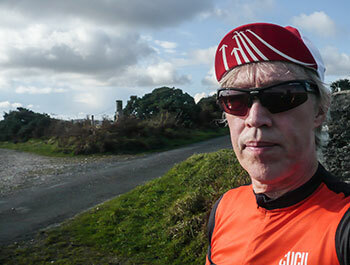 as a lifelong adopter of the belgian milieu, i would never exit the bike shed without a casquette below my cycle helmet, and as per the unwritten rules of cycling, that peak should always be worn in the down position when riding. disappointingly, this means that the inspired graphics are mostly hidden from view. therefore i would respectfully suggest that any future creations or revisions, place the design atop the peak either instead of, or as well as, the underside. i appreciate that this will make little or no difference to my grimpeurship, but at least it'll look impressive to those descending in the opposite direction, or to the civilian population in the coffee stop. that apart, this is a handmade delight, that probably also cures dandruff. this is cambridge's handmade grimpeur cap retails at £23 in sizes xs to xl (small reviewed) in either black or red with a choice of two designs under the peak.